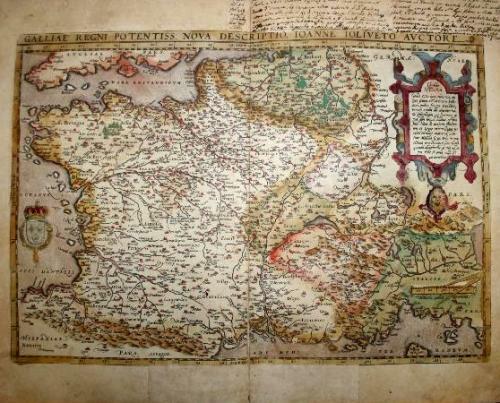 From the Theatrum Orbis Terrarum. Latin text on verso. A decorative view of 16th Century France that is derived from Jean Jolivet's woodcut map of 1560. Decorated with one large cartouche and one smaller royal crest. The map is very detailed including mountains, rivers, towns and cities. In average condition with old writing in the text, toning, a few little wormholes in the area of centerfold (2 reinforced with transparent paper into the map), lower white margin partly reinforced. Full of character.